Tis the Season at Falling Rock! As we head into the holiday season, more and more taps are being taken over at Falling Rock Tap House in Denver with winter and holiday ales. Check out the official announcement from Chris, owner of Falling Rock Tap House in Denver, about their holiday tap wall availability. Visit them at 1919 Blake Street in Denver - not too far from Coors Field. The Christmas Beers are beginning to make their way onto the tap wall, so come down and check them out! The only way to taste all of the ones we will tap this year is to start now and check back often!! Tuesday November 29th 5-7pm Firestone Walker special tasy treats with David Walker. If you missed the Anniversary Ale come try some of the component beers, bravo Imperial Brown ale, Double Jack, and Denver's newest addition, gold medal winner for American pale ale, Pale 31 on cask! Then hang out for the Christmas Beer Dinner. Tuesday, November 29th 7pm. 14th Annual Christmas Beer Dinner. Chef Cheryl is already brainstorming over this year's deliciousness to be paired with the current & past crops of Holiday Beers. We will have a 4-5 course meal paired with around 10 different Holiday Beers from this & past Vintages. This will be the first opportunity to sample the past vintages as most of them we only have one keg (most in a 5 gal size) of the past vintages. Tix on Sale at 11:11 on 11/11/11 $55 per person if purchased by Sunday November 27th at 7pm. $60 after that, if still available. 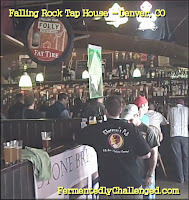 - Falling Rock Tap House posts year end 2011 events. 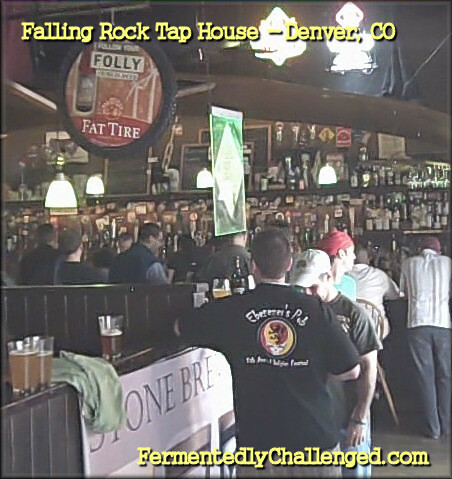 - Fallign Rock rolls out 2011 GABF Events. - The Best Beer Bars in Denver.